Mumbai: The last week of September turned out to be a hectic one in the primary market as eight companies filed documents for their initial public offerings (IPOs) with the Securities and Exchange Board of India (Sebi). On Friday, private equity firm Baring Private Equity Asia-owned cash management company CMS Info Systems Ltd, ADV Partners-backed contract electronics manufacturer Amber Enterprises India Ltd and Seven Islands Shipping Ltd filed their draft red herring prospectus (DRHP) with Sebi. 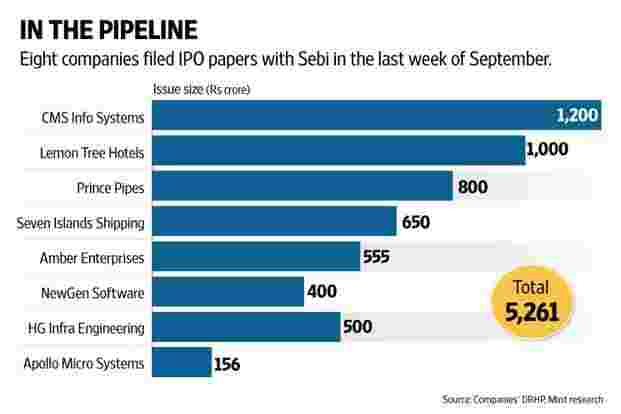 Earlier in the week, other companies that filed their IPO documents included Prince Pipes and Fittings Ltd, Newgen Software Technologies Ltd, HG Infra Engineering Ltd, Lemon Tree Hotels Ltd and Apollo Micro Systems Ltd. Collectively these eight companies are looking to raise over Rs5,000 crore. Amber Enterprises plans to raise Rs555 crore through its initial share sale, of which the company plans to raise Rs450 crore through a primary offering for debt repayment and other general corporate purposes, while its promoters plan to sell shares worth Rs105 crore through a secondary offering. Amber makes air-conditioning units for various home appliance brands such as Daikin, Hitachi, LG, Panasonic, Voltas and Whirlpool. Seven Islands Shipping, a shipping company which operates in the segments of crude oil trade and liquid products and serves clients such as Indian Oil Corp. Ltd, Hindustan Petroleum Corp. Ltd and Bharat Petroleum Corp. Ltd, plans to raise Rs650 crore in its initial share sale through a mix of primary and secondary offerings. The company is looking to raise Rs450 crore in primary capital, which it plans to use for buying a VLCC (very large crude carrier) vessel in the secondary market. The CMS Info Systems IPO is a pure offer for sale, which will see private equity fund Baring Private Equity Asia sell part of its stake in the company to the public. The share sale is expected to fetch the PE firm around Rs1,000-1,200 crore. The Indian IPO market has been a busy one this year, with several large share sales such as the Rs8,400 crore one by SBI Life Insurance Co. Ltd and the Rs5,700 crore ICICI Lombard General Insurance Co. Ltd issue hitting the markets in September. So far this year, 24 companies have raised around Rs30,682.40 crore through IPOs, data from primary market tracker Prime Database shows. In 2015 and 2016, 47 companies had tapped the IPO route to raise around Rs40,107 crore, data shows. Several other major IPOs are expected to hit the market in the coming months. The IPO pipeline is being led by the insurance sector, which across three issuances—HDFC Life Insurance Co. Ltd, General Insurance Co. of India Ltd and New India Assurance Ltd—is expected to see share sales of close to Rs30,000 crore. Other companies such as Godrej Agrovet Ltd and Indian Energy Exchange Ltd too have announced plans to launch their respective share sales in the month of October. The two companies plan to raise Rs1,157 and Rs1,000 crore, respectively from their IPOs. With the strong pipeline of IPOs that are lined up for launch in the coming months, 2017 is poised to see record IPO fund-raising, surpassing the previous record of Rs37,534.65 crore seen in 2010.